Quality Color Linked with Efficiency. 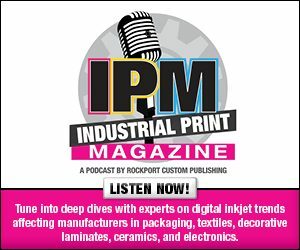 Digital Inkjet Hybrid Press for Labels. The first part in this series of spotlights digital label printing by Printing Innovation Middle East (Pime) Label Co., a label printer for carpet manufacturers. Not only did the company add digital printing capabilities to its business model, it also decided to become a distributor of the same printer to its own customers. Recognizing the value of digital print, Pime is changing the way labels are produced for the carpet and textile sector in the Middle East and Turkey. Now we turn to the U.S., specifically Keene, NH, to learn about how digital plays a role in the continuing evolution of Electronic Imaging Materials, Inc. (EIM). Founded in 1987 with three employees, today the specialty label printer operates out of a 20,000 square foot location with 40 members of its staff serving industrial, distribution, and scientific markets. Involved in print for over 20 years, the company first started working with thermal transfer, then added dry toner, and then inkjet digital print eight years ago. Digital printing is used for the customization of very short runs with multiple versions and variable data. Variable full color is another capability the company offers, where each label has color elements that vary, although Sage Yudelson, business development, EIM, admits it continues to hone this offering. Medium to longer sized runs are completed with flexographic printing. This includes one to two color, color coding, and machine readable marketing for labels. The company installed an mPrint mLabel printing system at the end of 2017. While EIM previously operated two UV inkjet presses, the mLabel is the first UV digital inkjet hybrid press with inline die cutting used in the shop. Equipped with variable printing capabilities such as 1D/2D barcodes, serialization, and customization data, the press prints at up 75 meters per minute with a maximum material width of ten inches. Efficiency played a role in EIM’s decision to add the mLabel. “Under the direction of one operator, a hybrid solution like the mLabel transforms blank stock to fully finished variable color in a single pass. We specialize in customization and the mLabel inkjet technology has the ability to quickly create and vary label designs,” explains Yudelson. Another advantage is the production of high-quality color prints without requiring additional lamination—even though the press is equipped with inline lamination features. “Colors appear vivid and crisp, and the final product is durable enough to withstand direct sun and chemical exposure,” shares Yudelson. The mLabel is equipped to run standard CMYK, however green, orange, violet, and white are add-on options that EIM is considering for the future. Long-time EIM customers benefit from the mLabel purchase. Take for example The Bread Shed, also located in Keene. EIM printed packaging featuring color-coded bands, which depict the different varieties of baked goods like breads and cookies. In business for seven years, the bakery wanted to celebrate its success with a revamp of its product packaging labels. “The short-run nature of The Bread Shed’s seasonal offerings made it an ideal project to run on the mLabel. EIM’s involvement in the design of the packaging made it an exciting project to complete on the new machinery,” says Yudelson. Efficiency and high-quality color are two traits EIM prides itself on. The mLabel complements both with its hybrid configuration as well as crisp colors that many times do not require additional lamination. The final article in this three-part series focuses on big box retailer Kmart and its adoption of digitally printed labels at point of sale. Click here to read part three of this exclusive online series, Personalization at Point of Sale.